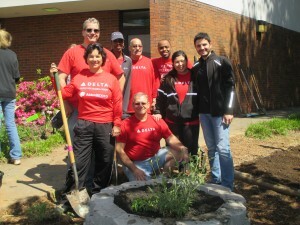 We Got Down & Dirty… In Our Learning Garden! 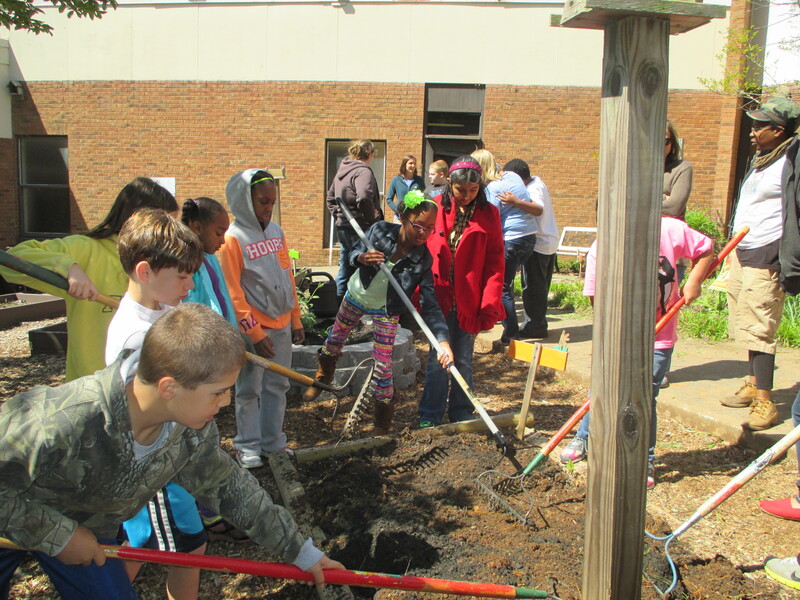 The Kincaid Foundation is partnering with the Captain Planet Foundation to turn our outdoor garden into a full-fledged Learning Garden! As part of this partnership, the Captain Planet team is providing Kincaid with several outdoor lesson and supplies for each grade level and helping us to improve our garden. 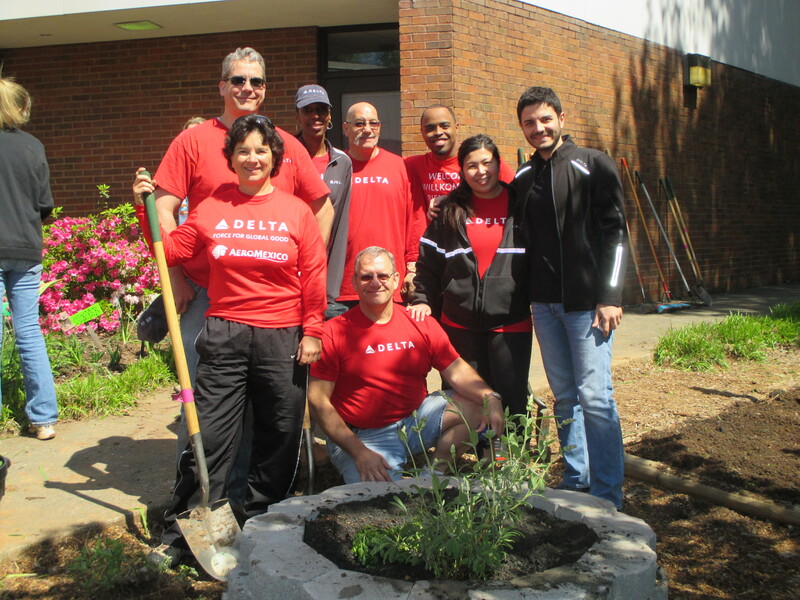 The Captain Planet team, volunteers from Delta, Kincaid parent volunteers, and several of our 2nd – 5th grade classes worked together on Thursday, April 17th to build beds, add compost to the beds, plant, and clean up the garden area. 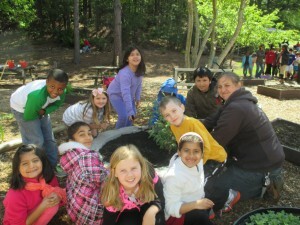 The Kincaid Kindergarteners have been learning about plants and what they need to survive. 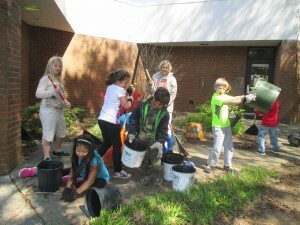 Each student planted grass in a cup. We decorated the cups to look like a person’s head and the grass will be the hair. 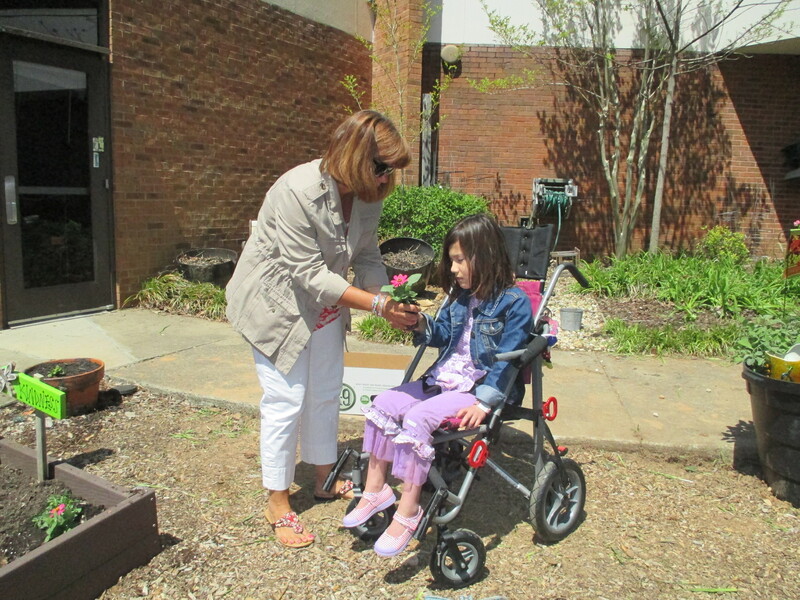 This month we used our senses to explore the Kincaid Garden in a garden scavenger hunt. The carrots, radishes, and snow peas we planted last month are growing well in the garden. We hope to be able to harvest some of them before our summer break. This month, we compared what animals need to survive to what plants need and found that we need some of the same things. As part of our unit on animals we examined live earth worms in the science lab. We learned that the main sense organ of an earth worm is its skin and learned how they can help our gardens. Earlier this year, the first graders learned about George Washington Carver. We have been growing sweet potato slips in the classrooms and will plant them in the garden in May. 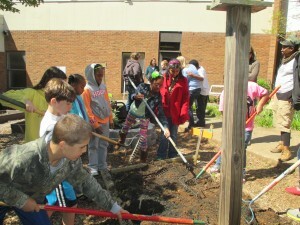 In the fall, when your first grader is in second grade they will help harvest the sweet potatoes. We will use the sweet potatoes in a recipe and all students will have the opportunity to taste it. The second graders have been learning about the life cycle of a butterfly. Each class has received painted lady butterfly larva. Students will observe the caterpillar’s life cycle as they pupate, and then go through metamorphosis and become butterflies! After they develop into butterflies we will release them into the Kincaid Gardens. During their last visit to the science lab, they practiced using common lab equipment and measured the weight and size of various objects. In March we had a Magnet exploration lab. One of the activities was making an electromagnet which is a temporary magnet. This month we made Solar ovens out of pizza boxes. In May we will take them outside and see if we can bake S’mores in them and record the temperature inside our solar ovens. We will also be dissecting owl pellets as part of our habitat unit. As part of the dissection lab we will learn about the owl’s role in food chains. The fourth graders learned about animal adaptations in a fun activity “Eating Like A Bird”. We also learned about food webs and discussed how changes in an ecosystem can affect food chains and populations of animals. We watched an interesting video “How Wolves Change Rivers” which showed how the reintroduction of wolves to Yellowstone National Park affected not only the other wildlife living there but also changed the land. Here is the link if you would like to view it. As an extension of our unit on matter we learned about polymers and made “atomic worms”. Earlier this year the fifth graders learned about Cells and Heredity. We used what we learned about the parts of animal and plant cells to go through a process to extract the DNA from bananas. In May, we will get the microscopes out again and observe pond water to see what microscopic organisms we can find.